Uberdude: I'd say this is an example of shortage of liberties (Damezumari), though perhaps there is a more specific name for this type on the edge. senderle: Yes, it's a watari, but that term is more general; not every watari involves a shortage of liberties that prevents the opponent from cutting. I like mineshaft tesuji! Something from the endgame. Beginner's level. gives double atari ignoring the osae, black tries to attack back with , and cuts. Further analysed at Send Two Return One Watari. Jared Beck: The same tesuji, also common with beginners. I wish I still got to play simple tesuji like this. My opponents don't make such mistakes anymore! 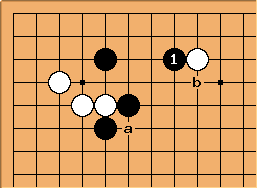 Rather than calling this move a tesuji, however, I think makes more sense to call Black 2 "Anti-suji" This paradigm of learning the wrong move is more helpful to beginners than the paradigm of learning the response to the wrong move. I borrow the term "Anti-suji" from Sakata Eio's book "Tesuji and Anti-suji of Go"
Paul: I love this tesuji because my friend and I discovered it ourselves when we used to play Go together when at primary school. My friend used to call it "the old sea captain's trick"! Guest: As a begineer I'd really appreciate some clues as to a good response to this. This happens sometimes even at IGS 5k* level. But in most games it is never played and remains a hidden threat that limits opponent's freedom of choice. Calvin: is a light way to play, which makes miai of a and b. Both of these tesuji work by making the opponent choose between answering an attachment (which is usually good) or protecting or taking advantage of a move nearby. Either way, you get something. I find this idea rather interesting, but don't know what they are called. tderz: That example is either in GalacticGo (Vol. 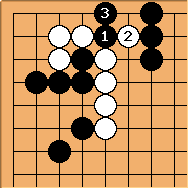 1) or in "Whole board Tesujis". I will check whether they gave it a name there. Slarty: Yes it's interesting, although an idea instead of a local pattern. Perhaps "creating a (second) good followup," "tenuki probe" or "contact with miai followup." Playing two local moves in a row: "time travel"